Sydney, Australia and Embedded World, Nürnberg – 4D Systems today announced the gen4-4DPI series of LCD display modules that support the Raspberry Pi family of single board computers. Available in three different screen sizes, 4.3, 5.0 and 7.0 inch, the display modules connect to a Raspberry Pi through a 30 pin FPC cable and an adapter board that conforms to both the Raspberry Pi expansion header pin-out and Pi’s HAT device identification standard. Designed to be the primary graphical display, replacing the use of an HDMI or composite display, the display modules are available with resistive or capacitive touch control options. A cover lens bezel option is available for the capacitive touch display, this providing an extremely easy way to mount the display within a suitable enclosure resulting in a sleek, slim, robust, and aesthetically pleasing look. The display is powered directly from the Raspberry Pi, making for simplicity of operation. The gen4-4DPI series can be used for the Raspberry Pi A+, B+, 3, Zero and Zero W. The gen4-4DPI-70CT, for example, is a 7 inch 800 x 480 pixel display with capacitive touch and a cover glass bezel. The smallest screen size is the gen4-4DPI-43T, a 4.3 inch 480 x 272 pixel display with a resistive touch capability. A full list of the display modules can be found here. The low cost community supported Raspberry Pi family is an extremely popular SBC that has found widespread adoption from makers to professional embedded developers. Its extensive peripheral features, open-source operating system and comprehensive programming language support makes it the ideal candidate for use in a wide variety of industrial and commercial designs. 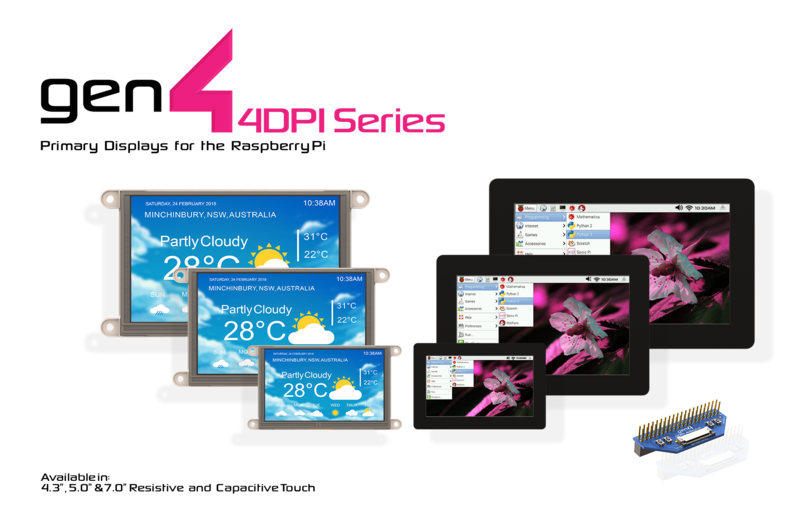 The gen4-4DPI series enhances the Pi’s attractiveness even further by providing a compact and elegant HMI display solution. The gen4-4DPI is available to order now, a full datasheet will be available upon release at the end of March 2018.